Oulu is a city and municipality of inhabitants in the region of Northern Ostrobothnia, Finland. 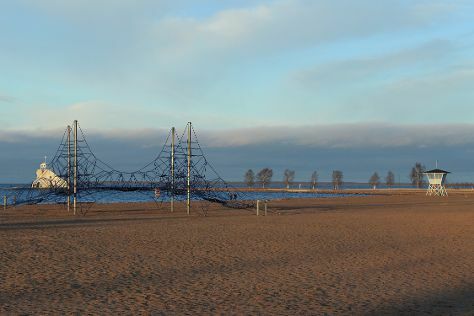 On the 27th (Sat), make a trip to Kauppahalli, tour the pleasant surroundings at Ainolan Puisto, then see the interesting displays at Oulun Automuseo, then enjoy the sand and surf at Nallikari Beach, and finally pause for some photo ops at Toripolliisi. On the 28th (Sun), you'll have a packed day of sightseeing: get a taste of the local shopping with Pohjoisen Valokuvakeskus, examine the collection at Pohjois-Pohjanmaan museo, then have fun at Tietomaa, and finally contemplate in the serene atmosphere at Oulu Cathedral. To find maps, ratings, photos, and more tourist information, use the Oulu trip planner . In October, daytime highs in Oulu are 6°C, while nighttime lows are 0°C. Wrap up your sightseeing on the 28th (Sun) early enough to travel back home.